In the four months leading up to the North Korean Workers’ Party Congress convening on May 6, the country’s young dictator, Kim Jong Un, has ordered up a dazzling display of the country’s putative prowess in nuclear weaponry. The mixed results of nuclear and missile testing may succeed in impressing Kim’s domestic audience and alarming or inciting his neighbors to the south. But the testing also demonstrates that North Korea’s achievements fall far short of its claims and that political goals rather than technological imperatives are driving weapons development programs. Pyongyang is slated to open its seventh ever Korean Workers’ Party Congress on Friday, May 6. The last time North Korea held the congress for its founding political party was in 1980. These meetings began before the Korean War, and the congress has served as a forum for setting political priorities and rolling out policies. At the last party congress, Kim Jong Il was announced as the heir apparent to the state’s founder Kim Il Sung. Kim Jong Un, who became supreme leader after his father’s death in 2011, may have a combination of objectives in mind for holding the party congress now. One may be to continue consolidating his power by building his image as infallible leader of North Korea. The congress is designed to demonstrate the North Korean peoples’ unified support for their leader, according to Pyongyang’s foreign minister. And to solidify that support, Kim may well point to the military achievements of his regime, showcasing North Korea’s military’s might and the symbols of its nuclear deterrent – however premature such claims may appear to objective observers on the outside. Another objective may be to announce a shift toward economic development. Kim Jong Un’s operating policy has been that of byungjin, which calls for simultaneous development of both the economy and the nuclear weapons program. During Kim’s rule, North Korea’s economy, however, has been increasingly restricted by UN Security Council sanctions and individual states’ sanctions in response to nuclear and missile activities banned by the Security Council. In practice, byungjin is an empty promise: it is doubtful that Kim could achieve any real economic turnaround for his state without engaging the international community. North Korea’s interlocutors in the six-party negotiating process are unified in insisting that engagement, and therefore any hope for normalization, can only take place if North Korea agrees to negotiate on its nuclear weapons. In calling the congress, Kim may be acting on a combination of these and other motives. Whatever the ultimate policy line is, it is likely to be based on the need to bolster regime survivability. Already in 2016, North Korea has conducted an unprecedented number of tests bearing on its ability to wield nuclear-tipped ballistic missiles. First and foremost was the country’s fourth underground nuclear test on Jan. 6, claimed by Pyongyang to be a hydrogen bomb. On Feb. 7, North Korea conducted the fourth launch of the three-stage, liquid-fueled Unha rocket, placing a satellite into orbit for the second time. This space launch vehicle has been a source of particular concern in the United States as a platform for validating technology relevant to building an intercontinental-range ballistic missile (ICBM). On March 18, North Korea launched two Nodong medium-range ballistic missiles (MRBMs). The single-stage, liquid-fueled Nodong is derived from sixty-year-old Soviet Scud missile technology, but has proven the most reliable missile in North Korea’s arsenal. It is also the only operational system, which can reach Japan and appears likely to be the first North Korea missile to be armed with nuclear warheads. Pyongyang has made efforts to demonstrate diversification of its missile capabilities. 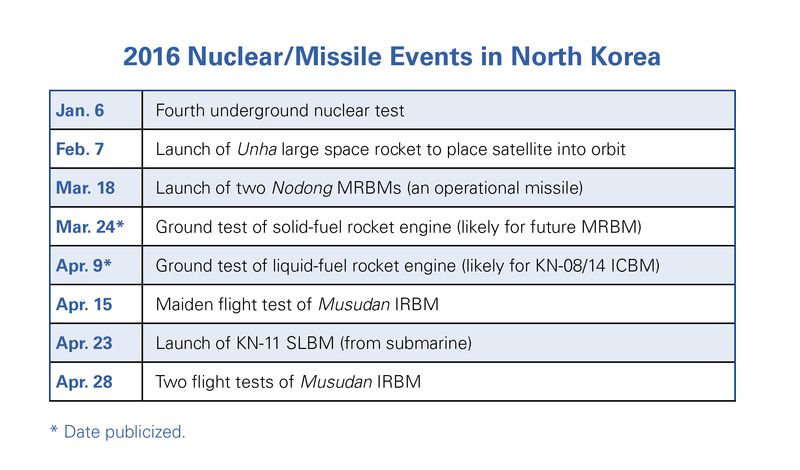 On March 24, North Korea claimed to have conducted for the first time a large solid-fuel rocket engine test (possibly for use in a future, two-stage MRBM). On April 9, it published photos of a more powerful, liquid-fuel rocket engine ground test (probably for use in a KN-08 ICBM). These tests were made known through Pyongyang’s online media channels. A new missile type was also flight-tested for the first time in April. Musudan intermediate-range ballistic missiles (IRBMs) flew on three separate occasions during the second half of April, each flight apparently ending in failure only seconds into the launch. 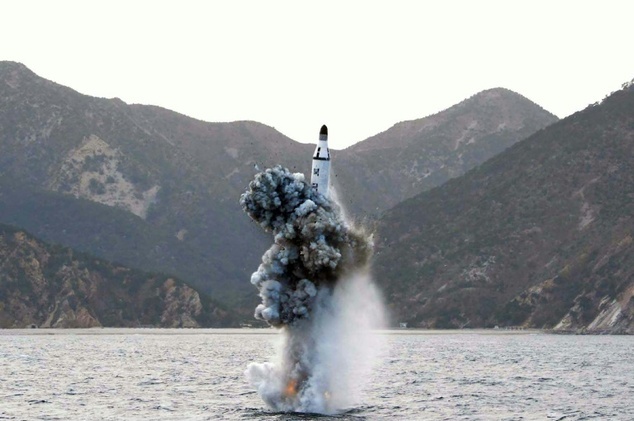 On April 23, a solid-fuel KN-11 submarine-launched ballistic missile (SLBM) was launched from a submarine and flew 30 km before reportedly suffering a catastrophic explosion. The launch may have been conducted to test the missile's launch and guidance sequences. Several ejection tests were conducted in 2015. Although the pace and breadth of North Korea’s weapons testing activity was unprecedented and Pyongyang achieved some significant milestones, the accomplishments fell far short of the regime’s claims. Outside experts were mostly in agreement that the Jan. 6 nuclear test was more likely of a boosted fission device rather than a more powerful fusion-based weapon. Although North Korea’s last two space launch efforts were successful in orbiting satellites, both satellites were apparently rendered inoperable, because they could not be stabilized. The maiden flights of the recently introduced KN-11 sea-launched ballistic missile (SLBM) and the Musudan IRBM both failed. The apparent failure of two additional Musudan flights, unannounced to the North Korean public, and the short interval between all three flight tests was quite revealing. Failures are a natural part of any weapons development program and provide the means of improving performance and ensuring reliability. But in order for failures to play this constructive role, sufficient time must elapse between tests so the engineers can diagnose, modify, and validate the modifications – usually a period of months. Yet the second launch occurred only 13 days after the first and the third launch occurred on the same day as the second. The rapidity of the missiles launches, and secrecy around the failed tests, provides strong evidence that Kim’s driving motivation for this year’s flurry of nuclear and missile activity is to demonstrate military advances to his own people prior to the party congress. Secondarily, Kim presumably wants to convince foreign skeptics that North Korea is making real progress toward achieving a viable and robust nuclear deterrent. Displaying an alleged nuclear weapon and a heat shield, and announcing a re-entry vehicle ground simulation test suggest that he wants to convince outside experts that North Korea’s claimed advances are not illusory. At the very least, North Korea’s recent hyperactivity reminds the world that Pyongyang is making progress on achieving its nuclear ambitions – however one chooses to measure the speed of that progress. If current trend-lines continue, North Korea will probably be able to pose a genuine nuclear threat to the U.S. mainland within a decade, perhaps as soon as 2020. From Pyongyang’s perspective, the United States is already acting as if North Korea had achieved a viable nuclear deterrent. U.S. THAAD ballistic missile defenses were rushed to Guam to protect against the Musudan IRBM, long before any test launch had ever been attempted. The head of the U.S. Northern Command testified to Congress last year that North Korea’s road-mobile ICBMs were operational, even though they had never been flight-tested. And given uncertainties in weighing North Korea’s progress in miniaturizing nuclear warheads for missile delivery, it is reasonable to conclude that the U.S. intelligence community will not be able to assure the president with high confidence that South Korea and Japan are not vulnerable to a North Korean nuclear strike. In spite of President Barack Obama’s success in the Iran nuclear deal, progress made in the nuclear security summit process, and his emphasis on the goal of achieving a world free of nuclear weapons, stemming proliferation in North Korea has not been an active policy priority for the administration. While voters from both political parties label “terrorism and national security” as priority issues in the 2016 political campaign and identify North Korea as the “greatest enemy” to the United States, the North Korean nuclear issue seems unlikely to influence the election, absent the emergence of an acute crisis. North Korea has employed its own version of strategic patience during election years in the United States and South Korea in the past, preferring to hold off on negotiations to see if election results could usher in more favorable administrations. Moreover, the United States has dismissed diplomatic probes by Pyongyang this year as being an insufficient basis for negotiations. The first months of a new U.S. administration in 2017 will be critical for exploring new opportunities in the relationship with North Korea. The public view in the United States that North Korea is an untrustworthy actor and that it deserves to be sanctioned and isolated, will make it difficult for a future U.S. president to chart a course toward a negotiated solution. Yet, absent a negotiated solution, the North Korean nuclear threat is likely to continue to grow. The additional pain of the recent sanctions should be felt within months. If the leadership cadre becomes disenchanted as a result of tightened sanctions and deepening isolation, Kim may adopt a different tack that allows for productive diplomatic engagement. And if he believes North Korea has already achieved a “virtual” nuclear deterrent, which already provides protection against U.S. and/or South Korean “aggression,” he may be amenable to accepting a freeze on nuclear and long-range missile tests. If so, it will be the daunting challenge of a new U.S. administration to sustain domestic and international support for formulating a realistic approach – one which may fall short of achieving denuclearization in the near-term, but prevents the situation from getting worse and protects the long term interests of the United States and its allies.